Replacing Disabled Hands with Bionic Prosthetics « Adafruit Industries – Makers, hackers, artists, designers and engineers! Scientific American has a hopeful piece on a new procedure for people who have lost sensation and function to a hand. Some 1.6 million people in the U.S. live with limb loss, according to a 2008 study, and that number could more than double by 2050. Modern prostheses enable replacements of limbs lost to injury or disease. But people who lose functionality in an otherwise healthy arm or leg have had few options. 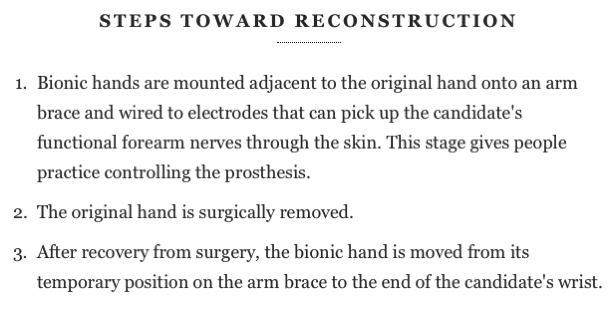 A team of surgeons in Vienna, Austria, however, recently developed bionic reconstructions of the hands of 16 people who had lost manual control and sensation because of nerve damage. The catch: patients have to undergo a nonessential amputation of the damaged hand to make room for the prosthesis. The approach improved hand dexterity beyond what would be possible with surgical intervention, according to the research, which was published online in January in the Journal of Neurosurgery. It also reduced the severe, spontaneous pain that can develop in limbs that sustain nerve damage.